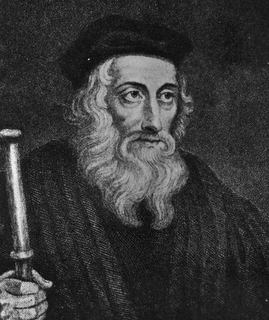 In 1384, John Wycliffe, the morning star of the reformation, died of a stroke in Lutterworth, England. His life, until its end, was the beginning of a recovery of the Scriptures and the Gospel from the corrupt and power hungry Church of Rome. Wycliffe broke with tradition by refusing to claim that the Church was the final authority in matters of faith. In 1378 he authored The Truth of Holy Scripture in which he claimed that the Bible alone was the authority for believers. He stated that church councils, tradition, and even the Pope himself were to be held accountable to the authority and teaching of Scripture. He also proclaimed that every Christian should be able to read the Bible for himself! This was novel, for the church not only controlled and interpreted the Bible for its members, but only the clergy were even allowed to own or read Bibles! Wycliffe’s answer was to publish the Bible in the everyday language of the people. Wycliffe went on to say that the office of Pope was an invention of men and not based on Scripture. He said that the Pope was indeed the antichrist, exalting himself in the place of Christ the Lord. Further, he stood up against the doctrine of transubstantiation – the idea that at the offering of the mass, the Eucharist, that the priest offered Jesus again as a sacrifice for God’s people and that the people then ate bread and wine which was literally the physical body and blood of Jesus. As Wycliffe continued in the teachings and tradition of Augustine his greatest contribution to the world was the Bible translated into everyday language. 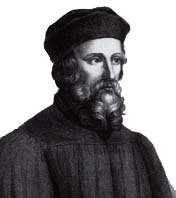 John Hus carried on the teachings of Wycliffe after his death. 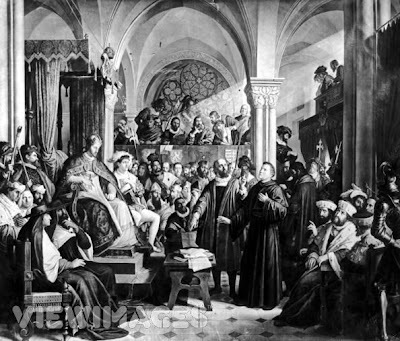 Hus, from Bohemia, not only encouraged the translation of the Word of God into the language of the people, but he preached in the language of the people instead of in Latin. He wanted the gospel to be heard and believed by those to whom he preached. Hus also rejected the power and authority of the Pope, and while at a meeting to discuss his views in 1415 was arrested and burnt at the stake for his “heresy.” The council also took the opportunity to posthumously proclaim Wycliffe a heretic, whereupon they dug up and burned his bones in contempt for his teaching and its influence on Hus. The name Hus, means literally “goose.” In the 100 years from 1415 to the early 1500s another man came on the scene, a man whose family crest was the picture of a swan. That man was Martin Luther. In the years between Hus and Luther there arose another figure of great importance, William Tyndale. He learned Greek so that he might translate the Word of God in the New Testament from the original language into English. You and I have our Bibles today because of the perseverance and hard work of William Tyndale. His English New Testament is perhaps the most important book ever published in the English language. Tyndale, while in attendance at a meeting with priests and bishops said that he “defied the Pope and all his laws” and vowed that “a plough-boy would know more of the Scriptures than they.” He was condemned as a blasphemer and heretic and burnt at the stake. 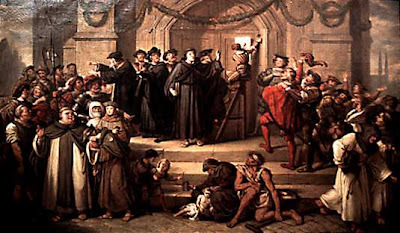 As the Word of God spread, and God continued moving upon men to proclaim the truth of the gospel, on the Eve of All Saints Day, October 31, 1517, (Reformation Day) exactly 493 years ago this week, a momentous and incredible event took place at the Church in Wittenberg, Germany, in fulfillment of Hus earlier prophecy. There this Roman Catholic monk named Martin Luther, the swan, challenged the leaders of the church that had burned the goose to a debate. He did so in the form of a protest. Luther had long been studying the Scriptures and having been regenerated by the Spirit of God was given understanding as to what the Scriptures taught about sin, salvation, and especially about the justification of lost sinners by faith alone in Jesus Christ. He came to see, as had Wycliffe and Hus, that the sole authority for the church was the Word of God. At last, by the mercy of God, meditating day and night, I gave heed to the context of the words, namely, “In this the righteousness of God is revealed, as it is written, ‘The just shall live by faith’.” There I began to understand that the righteousness of God is that by which the righteous lives, by a gift of God, namely by faith. And this is the meaning: the righteousness of God is revealed by the gospel, God justifies us by faith, as it is written, “The just shall live by faith.” Here I felt that I was altogether born again and had entered paradise itself through open gates. As Luther reacted against and protested the selling of indulgences (money paid to the church for the forgiveness of sins) and many other abuses by the church – things that he saw the church doing that clearly contradicted the teachings of Holy Scripture – he made a list. His list of 95 offenses or abuses, which are referred to as Luther’s 95 Thesis was an indictment of the church and many of its tradition and practices. In challenging the church, he wanted a public debate, and so took and nailed his list to the church door at Wittenberg. He made a public protest by posting this in such a way. It was a public statement about the condition of the church and its relation to the truth of Holy Scripture. Do you wish to defend the books which are recognized as your work? Or to recant anything contained in them? . . .
You demand a simple answer. Here it is, plain and unvarnished. Unless I am convinced by Scripture or by plain reason (for I do not accept the authority of popes or councils, for they have often contradicted each other), my conscience is captive to the Word of God. I cannot and I will not recant anything, for to go against conscience is neither right nor safe.. God help me. Amen. Here I stand, I cannot do otherwise. As history unfolded around him, this date and time at that church door have become the spark that brought FIRES of renewal to the church and freed to gospel from the clutches of the cultic church controlled by Rome and the Pope. This spark, this birth of a protest against the abuses of the Church, is known to us today as the Protestant Reformation. This turning point in history has given us many rich traditions and doctrines. The foundation of the Reformation of course is the doctrine of justification by faith alone. This truth sprung forth from the cornerstone, the conviction that God’s Word, the Holy Scriptures, was itself the sole infallible authority for life and faith, for salvation and Christian living, for the church and the world.